This is an overall good jacket, but has some flaws. I ride everyday no matter what the weather. The good: + The outlast liner is nice and warm when it's cold outside. Very good. + The waterproofing is good. So far been out in some torrential rain and not got wet yet. + The front pockets are very short depth which is excellent. Means your keys don't get lost at the bottom of the pocket. The bad: - The zip to attach the matching trousers is only a flap, and is mounted so high on the jacket that in the event of sliding down the road the jacket could still ride halfway up your torso exposing skin to the road. Not good. - The outlast liner has some fancy marketing that says it cools in the heat and warms you in the cold weather using Nasa tech. This is rubbish. The liner is nice and warm, but you will sweat your bits off if the ambient temp gets above 15 degrees. - The neck is not very high, so in cold weather your neck gets cold and the wind tries it's best to creep down your chest. Not too bad, but not perfect. - THE ZIPS! None of the zips have a grabber on them. This makes them far too small to operate with gloves on. Especially annoying on the cuff zips. In summary: A good, warm, completely waterproof jacket. A bit fiddly though. Very very good jacket. I am well impressed. The Outlast liner really does work. Kept me warm on cold days (sub 5deg) but importantly I did not overheat when the temperature rose. Haven't tried it in the rain as yet. I would say though that it's more suited to an upright riding position as I found wind rush over the back of my neck when I lean down. An excellent jacket and I was pleased when I saw it on sale! Jacket seems well made but haven't had cause to test the waterproofing yet. Very warm lining and good armour. Like other reviewers, I found it quite small relevant to marked size. The Medium is for up to 42 chest, I am just 40 and it is just about. Decided not to go for Large as the sleeves would be too long for me; it was a close run call though. Great jacket on the outside. The jacket is incredibly strong and robust and 100% waterproof without any inner linings in tested in one hours torrential rain. The armour feels really good and certainly gives a feel of protection. However. .............. Once the inner linings are out you are met with a really weak single stitched single layer of mesh. Which started coming apart at the stitching where it keep the armour in. Sent it back and Sportbikeshop sent me a new one within 24 hours which was incredible service. BUT the new jacket they've sent me has incurred the same problem after a week of commuting. Cannot understand how the jacket can be so strong durable and almost bullet proof feel to such weak inners. Mixed feelings. First time I use Sportsbikeshop and the service was reliable and efficient. Will definitely use it again. 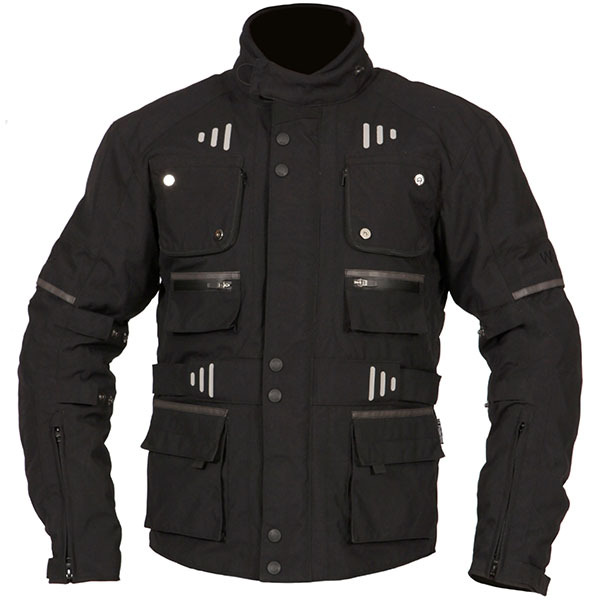 The jacket is excellent - warm, waterproof and I am glad to have gone up a size as suggested by other reviewers. Perfect fit on a large when I am usually a medium. I would agree with other reviews on Weise's sizing, you probably need one size larger. The Outlast layer works brilliantly, my daily commute takes about 30 mins, the recent subzero morning temperatures really put the this technology to the test - and it works! This time of year with similar temperatures with my old Heine Gericke gear had me needing a heated vest to stay warm. No such need so far, admittedly I'm not on fast A roads or m/way, but impressive non the less. Great value for money at Sportsbikeshop and really excellent delivery and customer service. Good value and excellent service from Sportsbikeshop as usual. However, Weise' sizing leaves a bit to be desired. For some reason I now need an extra large to fit. My previous Weise jacket was Large....and No, I have not put weight on! I've been using this jacket for over three months now and, performance-wise, it is very good. It kept me bone-dry riding the French autoroutes through eight hours of gales and torrential rain a couple of months back. Why Weise didn't add waterproof lining to the two small breast pockets is beyond me; make sure that you use locking plastic bags here. My other niggle is that the two main pockets should have been made larger. So far the Outlast liner has been great; your core doesn't overheat when the ambient temperature would not necessitate the use of a traditional thermal liner. I'll have to wait and see how it performs when the real winter temperatures are upon us. The ample venting works well in reasonably high temperatures but, like any heavy jacket, I had to ride with it open at above 30C. Overall then, it is a quality jacket which will, I'm sure, give many years of service.As with all my other Weise gear, I ordered one size up on the chart and it fits me perfectly.